These are the largest treefrogs in North America! - varying in color from dark green to pale gray. Will change color to match environment. May have spots that sometimes disappear (depending on environment) Big or little feet with the characteristic sticky pads on the toes. A half and half tank or a terrarium with a small dish with a small amount of (clean) water is necessary (these frogs do not like to swim too much-they only use the water to hydrate their skin.) Lot's of places to hide are a necessity - moss is definately recommended. 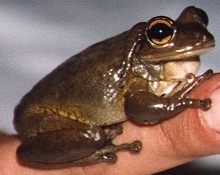 The temperature in the enclosure should not go much below 70� degrees unless you are prepared for hibernation, something which is not advised unless you are an experienced frog-keeper with acess to all temperature information for your specific species, and know how to construct a hydration chamber. Crickets are a main source of nutrition. See my page on Dealing with Crickets for more info. Cuban TFs can have a huge appetite. The females eat alot more than the males. In the warmer months they eat many more crickets than during the colder months. These frogs are noisy. They bark often usually at odd hours of the morning (3am). They sound like little dogs. Cuban TFs are a very hearty inexpensive species. Information on the longevity of frogs is available in the Weird Frog Facts section. These frogs are notorius for cannibalism...if there are other species of frogs in the tank, or even specimens of the same species, Cuban Tree Frogs have been known to feast on their neighbors! Remember, a frog doesn't need to be bigger to eat another frog, just hungry! This image was sent to me by Corey Hoyt. His name (the frogs I mean, of course!) is "Castro!" Corey Hoyt and Michelle Jacobs for providing information.